You’ll never buy a rotisserie chicken again. Start this recipe in the morning and have the chicken ready to rock by dinner time. Serve with some beautiful veggies and use the leftovers the next day for some chicken salad or some homemade chicken noodle soup! 3. 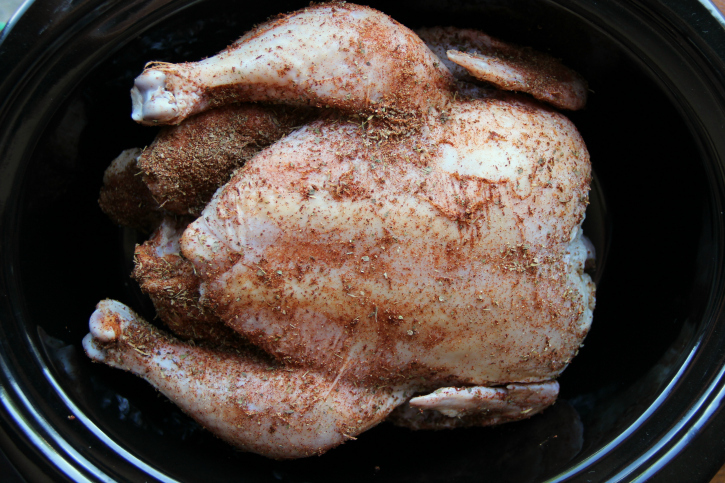 Rub seasoning over your entire chicken (including the inside of the bird). Place on top of foil balls. Cover and cook on HIGH for 4 – 5 hours, or LOW for 6 1/2 – 7 hours. Serve with some roasted veggies, mashed potatoes and out favorite cheesy rolls! Got leftovers? 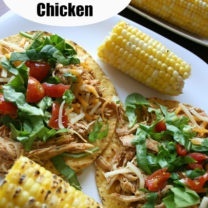 Use that chicken in one of these recipes! 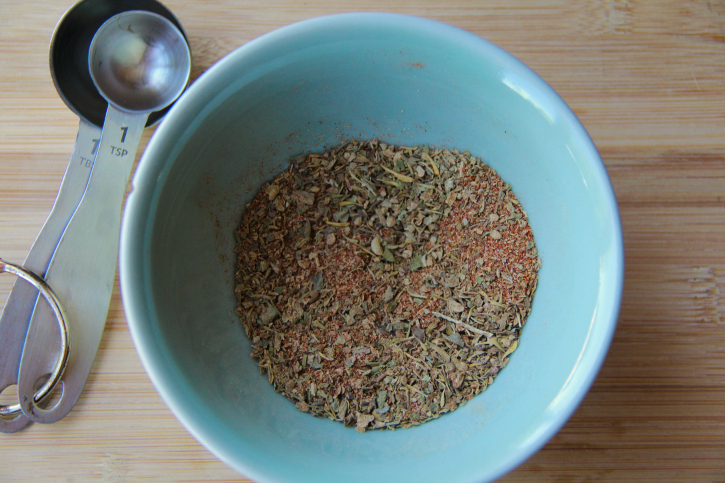 Start by mixing together paprika, all purpose seasoning, garlic powder and salt. Place 4 medium sized foil balls in bottom of crockpot. This will act as a stand to prevent the chicken from drying out. Rub seasoning over your entire chicken (including the inside of the bird). Place on top of foil balls. Cover and cook on HIGH for 4 - 5 hours, or LOW for 6 1/2 - 7 hours. 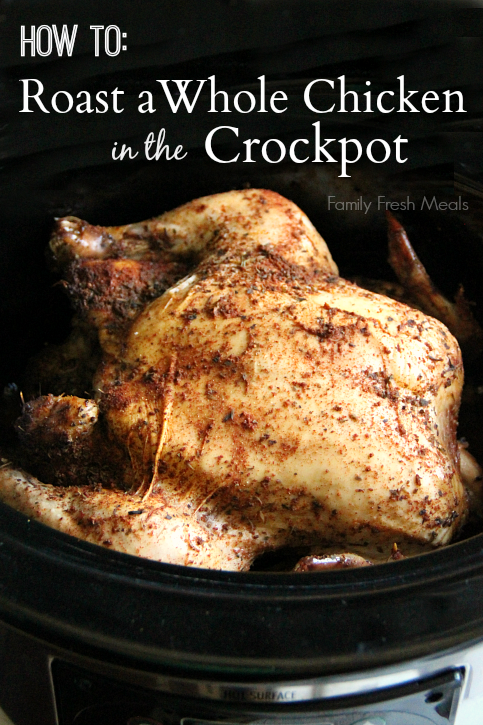 Here is what I used for this How to Roast a Whole Chicken in the Crockpot recipe! 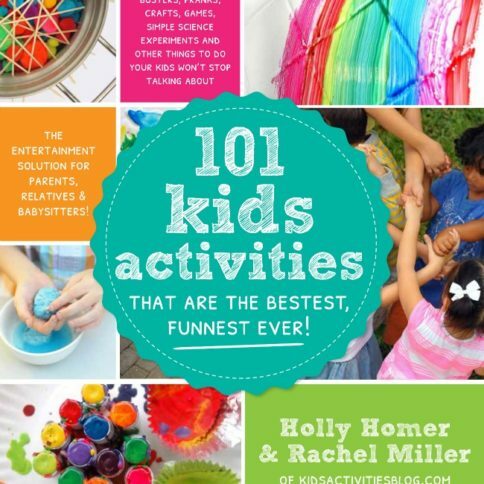 101 Kids Activities That are the Bestest Funnest Ever! Why is there no liquid in this recipe? I thought crockpots neede liquid in trhem? I wondered about the liquid as well. My variation is to use liquid, such as a can of beer OR a can of classic Coke instead of placing it on the foil balls. 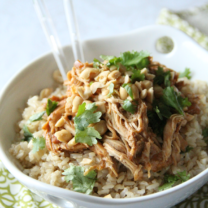 Moist and flavorful and just as easy. Variation using what I had on hand. Filled the bottom of the crockpot with baby carrots, fresh chopped ginger, chopped fresh garlic. Rubbed entire chicken inside and out with lemon pepper seasoning. Placed chicken on top of veggies. Cooked for 4 1/2 hours on high. Made roasted yukon golds on in oven. When done removed and chicken. Removed carrots from crock, topped them with fresh cilantro and roasted them in a hot oven for ten minutes. Oh don’t worry about the liquid, mine turned into boiled chicken. I didn’t add any liquid, but potatoes and carrots on the bottom of the crock. Cooking for eight hours? Don’t think so! Ready in six, following the directions. And this is NOT like a roasted chicken, again, boiled and you might as well make soup! (But that works too). ROAST YOUR CHICKENS IN THE OVEN OR A ROTISSERIE IF YOU WANT ROASTED CHICKEN, PEOPLE! Can this recipe be done with a larger chicken, say 5 1/2 or 6lb ??? I like to bake in oven in a clay pot. Use butter pam spray, sprinkle liberally with chicken seasoning (used several kids – all turned out great). 350 degrees for 2 to 3 hrs (depending on size). Done it twice got time mixed up and did extra hour, 8 hrs first time, 9 hrs second with 3.72lb bird. The first time came out perfect with moist juice chicken and better than rotisserie crispy skin. Second was a bit dry but still crispy skin. Your chicken must be getting too wet from your veggies. Try just using foil. I’ve made crockpot chicken a few times now. I noticed if you by cheaper chicken like at walmart even if it’s a name brand the crock pot will fill up with water. I have used organic chicken and minimal water, it came out perfect. This was absolutely fabulous. And I messed up and actually added about 1/2 Cup of water without thinking…..habit. Wonderful, wonderful, wonderful. One to go in my recipe box. I have made chicken this way for years and it turns out wonderful everytime. Using the foil balls keeps the chicken from getting greasy. Whether doing a whole chicken or whole chicken breasts, I like to make an herbed butter mixture under the skin to make an extremely moist and flavorful chicken. Do you inject that butter into the chicken?? I love herbed butter! I’ve rubbed the chicken with taco seasoning. Makes perfect chicken tacos. Could I add carrots and potatoes and an onion in the bottom of the crock pot to make it a meal and still turn out OK? I have made this in the past and put it on thick sliced onions. It keeps the chicken from sitting in its own grease and adds a little flavor. Also, if you put a couple of sticks of celery inside both cavities of the chicken while it is cooking, it prevents the chicken from drying out! I did this, and it turned out perfect. Could you use this method with a whole turkey(depending on how big of course)? I don’t get a whole turkey anymore. I get a boneless turkey roast and cook it the same way as the chicken. I don’t like white meat but fixed like this it is very juicey and I love it. I have done this for years, but I even putting it in frozen, since I am usually out for work longer than 8 hours. Since you have done it frozen, did you put it on high for 8 hours or did you put it on low? It would work on high if frozen. Just make sure before you freeze your chicken you take out all the inerds. Also, not sure how well the seasonings would stick, but you could always spray it with some PAM spray and then do the rub. That would probably work well. I almost always put food in my crock pot frozen…..I always forget to take stuff out to thaw in time. 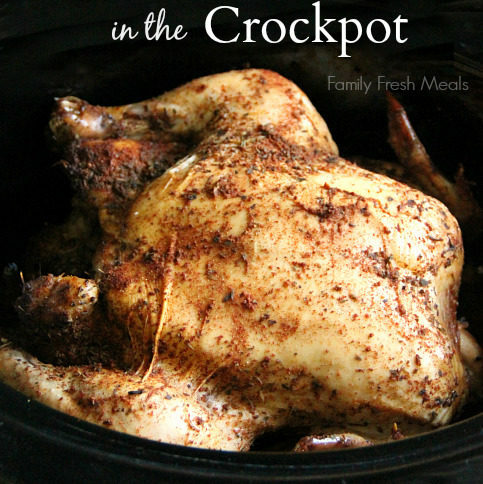 Don’t crockpot a frozen chicken. The bird will take so long defrosting, that bacteria can easily breed before it is even cooked. Yes Alyson! I just did this the other day and am going to add a note to the recipe about using the veggies! I just put a chicken in this morning. 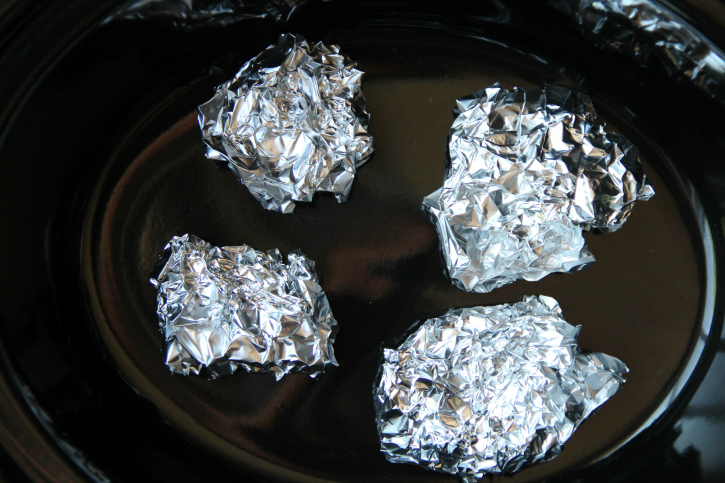 I don’t like veggies cooked in the crockpot so I made the foil balls but wrapped them in parchment to keep the “tin” taste away. Can’t wait to try it! The parchment paper will not protect the foil balls flavour at all (if it actually does happen) you are worried it will absorb into your chicken but not through parchment paper? I would never use foils balls since it seems gross and chemically to me and a simple natural alternative like onion or even a halved lemon or an apple makes the most sense. Whether or not you eat it after is up to you. I am no master chef but I made this the other day with veggies in the bottom and it was delicious. Super tender and juicy. Even my picky 2 year old kept coming back asking for more. Will definitely make again. Amy, did your veggies get cooked when putting them under the chicken? Did they get dried out or was there some liquid left in bottom. Also, how long did you cook yours for? What kind of veggies did you use. Did you need to put any liquid so that your vegetables didn’t burn or stick to the po?. I just saw this recipe and would like to try it tomarrow it sounds delicious. I meant to type pot sorry! Nope, once the veggies start heating up and the chicken starts cooking, liquid will be released so no need to add additional liquid. I would really like to try this….it sounds so easy…..do you think it will work in a dutch oven over the stove top? – Thanks. Will this work in a round crockpot? Or do you have to have an oval crockpot? I have cooked chicken this way several times. It is amazing how much liquid comes from the chicken and it still remains moist and so tender. I tend to do this naked, (not me) without seasoning, just butter under the skin. Could you transfer the chicken to a pan and stick it under a broiler for a few minutes to crisp up the skin? Looks good. Question: Breast side “Up” or “Down”? I do breast side up, but would be interested to see how it turned out the other way too! I read on a different site that breast down keeps the breast meat more moist. I cooked my turkey this Christmas breast down. It was SOOO moist and tasty. I’m going to try this recipe Saturday! Can you stuff the chicken with stuffing ? Could this work for a frozen whole chicken? Iv’e never done this…can any of they other readers help? I put mine in frozen and it works every time. Just add a little chicken stock and veggies to the bottom and I have a nice dinner when I get home. 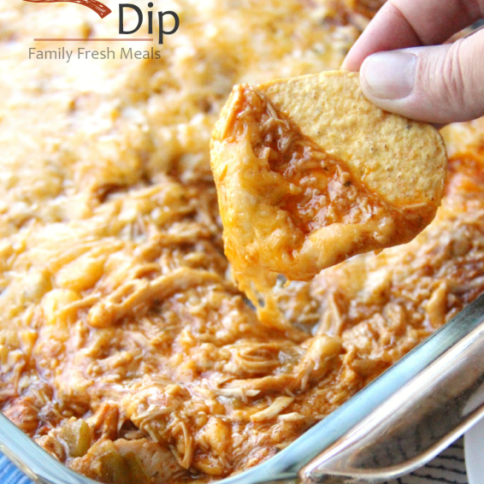 I also use the left overs for chicken burritos and those are even better! how long do you keep it in the crock pot (frozen) and low or high? I made this tonight and it was excellent. I used onions as the platform and it really added to the flavor. I definitely will be doing this again. Mine in crock pot now. I put onion and red pots in bottom along with fresh crushed garlic. Slices. Looking forward to a fantastic dinner tonight. Oh then I topped with fresh rosemary. I just got a crockpot where you can put the ‘crock’ on the stove as it is a pan and then transfer it to the heating element of the pot part of the crockpot. So I wonder if I should saute some veggies and then put the chicken in on top to cook?I have carrots and potatoes but apples sound good as well! I am anxious to try this recipe tonight. Is there any way of making the skin any least but crispy? I used this as a guideline, but I guess I wound up doing the whole thing differently. I started with Weber Smokey Mesquite seasoning and sprinkled it over the whole bird. I lined the bottom of the cooker with baby carrots. Once the chicken was in the cooker I covered the top of the chicken with a thin layer of honey. I had a 4 1/2 pound chicken. About half way through I added some more honey. It only took about 3 hours to cook on high. The result was juicy chicken with a flavor that was both a hint of sweet and had a bit of a bite to it. Delicious! And super easy. Will definitely be doing this again. If you use a frozen chicken for this, when would you take out the parts that are stuck inside? Just wait until it’s thawed enough? I couldn’t remove them while the chicken is frozen. Silly question I know, but I have no clue. Thanks! Run warm water into cavity to “thaw” the insides a little. It will make the inside removal easier. They should be removed before cooking. I work so I’m curious if its cooking for almost 11 hours should I keep out on low the entire time? I came across a similar recipe that said to put it on high for the 1st hour then turn it down. Maybe this helps to kill bugs int he chicken too?? I would slow cooking is just as delicious. I’m going to try cooking 2 smaller birds in the same crockpot (as they are all I have in) and rub them in home made piri piri sauce before cooking. We are a big family, 6. Being a realtor and my wife being a nurse we have busy schedules. I cook my whole chicken I a crock pot for 6-10 hrs sometimes. Even frozen about 3/4 the way through I baste it with bbq sauce, jerk sauce, Hawaiian or whatever. it always turns out delicious. With frozen you have to watch it after about 5 hrs…then decide if you want to add a rub or sauce…I tend to wait until almost done or done before I add sauce or rub. This also works well for just frozen breast, let cook all day and before you remove add sauce. We make a pulled bbq chicken breast that will blow your mind. With frozen breast or whole chicken or any meat you will get a lot of water in crock pot that will keep it juicy.. you can add some flour to make a gravy or use stock for something else. If you don’t have time to keep check on it, put frozen chicken in, salt, pepper, garlic powder and parsley flakes…wow!! Have 8 1/2 pound hen. What adjustments should I make for crock pot roasting? 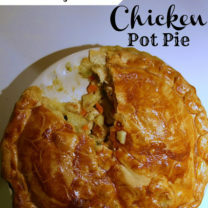 So I’ve been on this site for 5 minutes and already found two things I think my kids will eat (this chicken being one of them) Will try this over the weekend – thanks! The negative comments are right. This does not come out like roast chicken, more like boiled, even when cooked 4 hours on high. I don’t think it is worth wasting a chicken on. It might be that you used a smaller crock pot, leaving no room for the liquid to go. The larger size lets the liquid pool in around the foil or vegetables and the chicken sits up out of it., where it roasts. I just got a new crockpot for christmas, and wanted to test it out. (it was the one you featured in this post, actually). It was really easy to throw together, and tasted pretty darn good. i think next time i will rub a few more herbs under the skin for a more seasoned taste, the the chicken was moist, delicately seasoned, and delicious. bookmarking this page to make again, thanks for a great recipe! I was a bit skeptical to cook a whole chicken in the slow cooker. We tried it today – and it was delicious! We cooked a 6 1b chicken in the slow cooker for about 7 1/2 hours. I rubbed the chicken with butter, garlic salt, Mrs Dash, pepper and paprika. I used an onion and a potato each cut in half as the vegetables at the bottom to serve as a rack. The chicken was moist, delicious and perfectly cooked. My family loved it. No need for any liquid at all. There was plenty at the bottom from the chicken over time. An easy dinner! Thanks for the idea! Thanks for this recipe! I tried it tonight. I cooked it on low for 8 hours, then stuck it in the oven for 10 minutes on broiler. It was so good and the meat fell off the bone. My apartment also smells amazing. I’ll definitely be making this again. How do you get the bagged parts out of the inside of the bird if you put it in frozen? I’ve never frozen a whole chicken before, but I assume you’re to remove the inside items prior to freezing. If you don’t do that, you’d have to run the frozen bird under water long enough to loosen the items enough to pull them out and then rinse out the cavity at that time. do I have to use the spices listed here or could I use my own ? Sounds delish! I hope you love it! I have done this and it is great! Thanks! Tonight I am changing it up and using garlic salt, Zataran’s blackened seasoning, and Old Bay. I am going to set the chicken on two sweet potatoes. Yum! Wish me luck! I really liked the idea of using taco seasoning, hadn’t thought of that one. Will have to try. Male cooks take- bought a bigger bird. Used recipe plus some of the extras others shared. Used Smoked Paprika for an extra kick invthe rub mix. Lemon halves for the prop. Herbed butter j der the skin and celery sticks inside the cavity. I was a 7.5lb chicken. Cooked on low for 4 hours , then switched up to high for final 2. At hour 5, i took chicken out and drained the liquid, as it had almost cove t ed the bird. Returned enough liquid to about half the heigjt of the lemon halves. The chicken turned out great. Very moist and fall 🙂 off the bone tender. Thanks for the recipe. This recipe made my day!! First – I think the water content of the brand of chicken may explain the excess liquid. I used Trader Joe’s organic young hen 5 1/2 lbs and had 3 cups of juices which are gelled this a.m.
A bare bones throw together took less that 10 min. from getting crockpot down to putting the lid on (most of which was peeling the onion). I lined the bottom of crockpot with potatoes smaller than tennis balls – larger than racquet balls, put onion in the cavities, drizzled olive oil over the top and sprinkled thyme (color), salt and garlic powder. It cooked 4 hours on high and fell off the bone but was firm enough to remove it and place it on a plate. The potatoes were perfect. Today the chicken not flavorless like others I have done in crockpot, but firm and tasty. True no brown crust but it can be sliced like a roast hen instead of falling apart. I have passed this to all my friends and family!! Worked great. Used potatoes as platform. Make sure they’re thick. you have to keep the chicken up above the liquid. Next time I’ll do herb butter under the skin as others suggested and use more salt. Other than that, delish. For those wondering about starting with a frozen bird, it’s a HUGE food poisoning risk because coming from frozen, the bird stays in the risky temperature zone for hours. I’m not conservative on meat temps really, but the way chicken is raised, you have to be with poultry. I made this exactly to the instructions and it was awful!!!! So sorry to be a “debbie downer” but it came out so dry, almost chalky dry. The seasoning even tasted bad. Definitely sticking with my rotisserie. I agree! It’s best to do a whole chicken in the oven. I’m a personal chef and would never do a whole chicken in the crock pot! It pretty much does turn out like boiled chicken. Also the purpose of using your crockpot is so you can pretty much put your ingredients in and leave it, because a lot of people use their crockpots for that reason, so they can have supper cooked when they get home from work. I did not give it 3 stars !! I tried this technique today using a double-cut, bone-in pork chop. I brined the chop last night (when you finish off a jar of pickles, don’t throw it away; that’s good stuff! ), and put it on top of some tinfoil “wads” in the slow cooker for 3.5 hours on low one side; 3 hours on low for the other side. The bone popped right out, the meat was s-o-o-o-o tender, I just finished it off under the broiler covered in a sauce of: cherry jam, cider vinegar and Dijon mustard. The verdict? One of the best pork chop dinners I’ve ever had! It’s a great technique, I hope more people try dry cooking in the slow cooker. Cheers! Dale!!! This sounds amazing! I am drooling over here. Can’t wait to give this a try! I have made this 3 times now and it is awesome. Love putting red potatoes and baby carrots in as the base. The veggies cooked in the juice and seasoning gives them extra flavor. In addition to the other ingredients in the base recipe, I added a package of onion soup to the rub and dumped the excess in with the carrots and potatoes. Cook for about 5 1/2 hours on low. Chicken falls off the bone and veggies are perfectly cooked. Glad I found this one! I am NOT a cooking person and this was soooo easy and wonderful!! Even my husband the cook was very happy with how it turned out. He was amazed the chicken didn’t turn to mush. Kids loved it too. I used a bag of petite carrots and 2 chunks of onion as the base. My seasoning mixture was a mix of stuff my husband set out: basil leaves, salt, butter, rubbed sage. I put slices of butter under the skin in about 6 different places along with 4 basil leaves under the skin, salt went in the cavity. I did put the breast down (husband did not like that idea because it is hard to get to to slice off a piece). I set my crock on High for 4 hours and left the house 🙂 (It does go to a warm setting after the high 4) Came back home in 5 hours and it was perfect!! The carrots were great also with all the extra seasoning! Highly recommend for the non-cookers out there! My husband, the chef of the house, even approved!!!! I am so happy you loved it Angela! 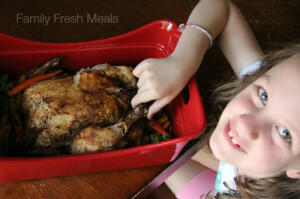 Yes, those yummy veggies you cook under the chicken are almost the best part! So delish! haha. yes, Yukon Gold potatoes cut into quarters, carrots, garlic, onions all make for a delicious dish when it’s all done. 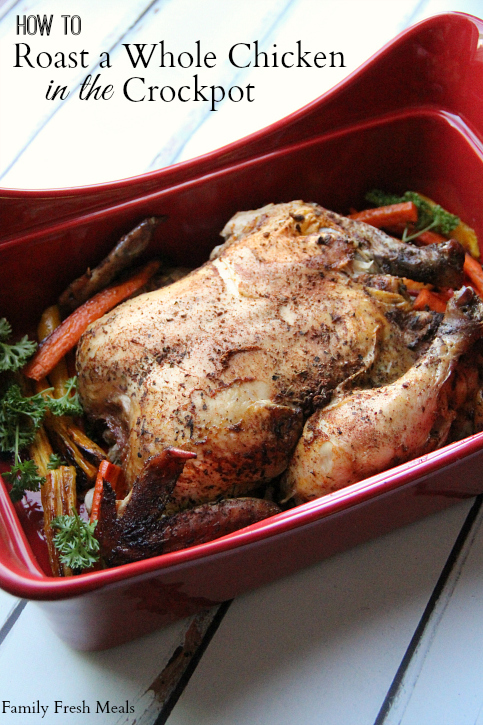 It’s not like a roasted chicken…more like chicken cooked off the bones and the veggies are so good. I used a thyme, paprika rub. I will make again!